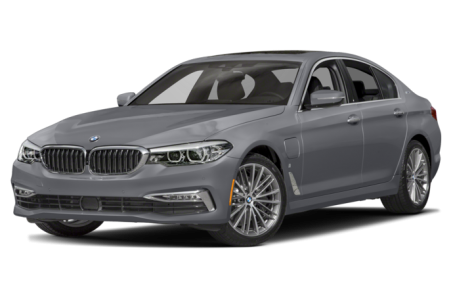 The 2018 530e is an all-new hybrid version of the 5 Series midsize sedan. Aside from the special badging, the 530e is virtually identical to the current 5 Series offerings. Standard features include adaptive LED headlights, LED fog lights, power/heated side mirrors with turn-signal indicators, a power moonroof, and 19-inch wheels. A hands-free trunk lid, soft-close automatic doors, and M Sport package are also available. Powering the 530e is a 248-hp, turbocharged 2.0-liter 4-cylinder engine and an electric motor mated to an 8-speed automatic transmission that produces 310 pounds-feet of torque. Rear-wheel is standard, while all-wheel drive (xDrive) is optional. Mounted beneath the rear seat is a 9.6 kWh lithium-ion battery, which can be recharged in 3.5 hours at a rate of 3.2 kWh. Inside, the 530e has a premium leatherette/wood-trim interior with a 40/20/40-split folding rear seat. The center stack features the standard BMW Navigation system that includes a 10.2-inch touchscreen, a 200 GB hard drive with 20 GB of storage for audio files, voice command recognition, Bluetooth connectivity for phone and audio, and a USB port. It can be upgraded with Apple CarPlay/Android Auto compatibility, a wireless charging station, a Wi-Fi hotspot, and a Harman Kardon premium audio system. Standard features include automatic climate control, a power tilt/telescoping steering wheel, and “one-touch” power windows. Nappa leather upholstery, a rear seat entertainment system, heated steering wheel, front and rear heated seats, front ventilated/massaging seats, proximity keyless entry, and push-button start are available as well. Standard safety features include a backup camera and adaptive cruise control. A surround view monitoring system, a blindspot monitoring system, daytime pedestrian detection, frontal collision warning, lane departure warning, and rear cross-traffic alert are also available.